Title: 'Angliae, Scotiae, et Hiberniae sive Britannicar Insularum Descriptio '. From: Atlantis Maioris Appendix, sive Pars Altera, ... Amsterdam, J. Janssonius. A rare and ornate map with inset portraits of James 1st, Henry Prince of Wales Princess Anne of Denmark, engraved map. 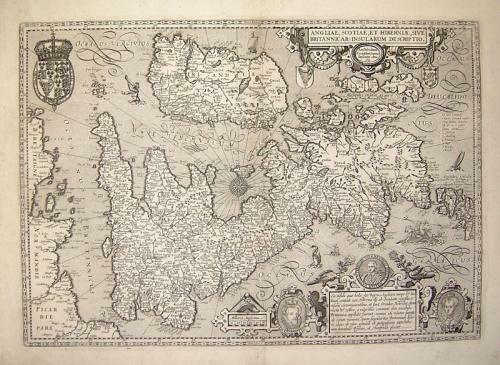 Jan Jansson acquired the elegant plate of Keere's 1604 British Isles map following Ortelius' outline and reissued it in 1621 with his own imprint in place of Keere's. In very good condition with three library stamps covered over on the verso. Very rare.